Best Selling Product, Why? Because it Works! Go Daily Supreme is a psyllium husk dietary fibre based colon cleanser in an easy-to-take powder form. It contains a unique blend of psyllium husk powder, L-Glutamine, prebiotics, probiotics, gut-soothing herbs and now, glucommanan and stevia leaf extract! 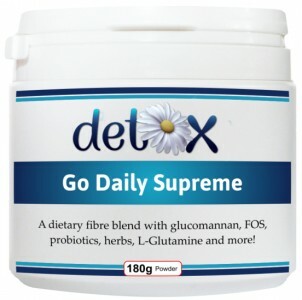 Due to its wide variety of nutrients, Go Daily is ideal for long-term use as a high fibre bowel cleanser and detoxifier, cell repair agent and overall colon maintenance formula. With the addition of glucomanna, it now also supports natural weight loss and appetite control, by supporting stable blood sugar levels and providing the body with a feeling of satiety. "Glucomannan contributes to the reduction of body weight in the context of an energy-restricted diet." Note: The claim may be used only for food which contains 1g of glucomannan per quantified portion. In order to bear the claim, information shall be given to the consumer that the beneficial effect is obtained with a daily intake of 3g of glucomannan in three doses of 1g each, together with 1-2 glasses of water, before meals and in the context of an energy-restricted diet. We have specifically changed the Go Daily formula so that 1 serving (5 grams) of powder now contains 1 gram of glucomannan. NOTE: Go Daily contains a minimum of 36 servings per tub, based on 5g servings. Contains no: added sugar, wheat, gluten, lactose, dairy or yeast. 1 to 2 heaped teaspoons of powder to be added to a small amount of water or juice (¼ of a glass). This is then to be mixed slowly in all directions until it turns into a smooth paste. Continue to stir as more liquid is added and until the glass is full. To be taken 1 to 3 times daily, with a minimum of 250ml liquid per 5g (1 heaped tsp). Best results are achieved when Go Daily is taken continuously for 2 - 3 months, together with improved eating habits.